Perhaps the question should not be why strength train, but why not. The reasons are exciting because it actually gives us some control in the quality of our lives. Let’s discuss a few reasons here, shall we? Our resting metabolism decreases approximately two to five percent every decade after 25 years of age? Consequently, our resting metabolism decreases approximately one-half percent every year. Every year after the age of 25, the average American gains one pound of body weight, yet loses one-third to one-half pound of muscle? Mix that cruel fact with gravity and an unhealthy lifestyle and it is easy to see why the scales go up and the body parts sag as we get older. Weight loss and weight control or maintenance is next to impossible without strength training, especially as we age. One pound of muscle burns about two to three times more calories a day than fat. The more toned and conditioned muscle a body has, the higher the metabolism and the more calories are burned even at rest. This means if we are not happy with our present appearance, level of fitness, weight, or strength level, we CAN strength train and change it. Now that truly does spell good news brothers and sisters!! Still wondering why strength train? I thought not. Must be why she looks so happy! That's right! Pump that iron, baby! 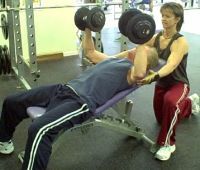 I believe that performing a safe and effective strength/resistance training routine on a regular basis is the closest thing to the FOUNTAIN OF YOUTH in existence. and body weight...just to name a few. DON'T LEAVE OUT AN ESSENTIAL INGREDIENT! Building a healthy body requires some type of resistance training, along with a cardio routine and proper nutrition. One without the other is like trying to follow a recipe without all the required ingredients. If strength training is not part of your present fitness regime, it should be! What are you waiting for? Check out my routines for some easy workouts to get you started. It has never been easier to begin a resistance training program no matter what your fitness level. The main thing is…just get started! Time is wasting and so is your muscle if you aren’t training it! I think the answer is crystal clear: to look, feel, and be the fittest and healthiest that we possibly can. No health and fitness regimen is complete without it. Just in case you need more reasons to support why strength train: Studies have shown that people in their 60's and 70's who strength train regularly actually have muscles that perform and look as well as people in their 20's and 30's. I told you it was like the Fountain of Youth. Now grab a dumbbell (and I don't mean your significant other) and get busy!